Whether you're camping with the family in the south of France or with a bunch of friends in the local countryside, the spacious Travel Lodge RT Tent is the ideal group tent. It's designed to accommodate up to seven people. 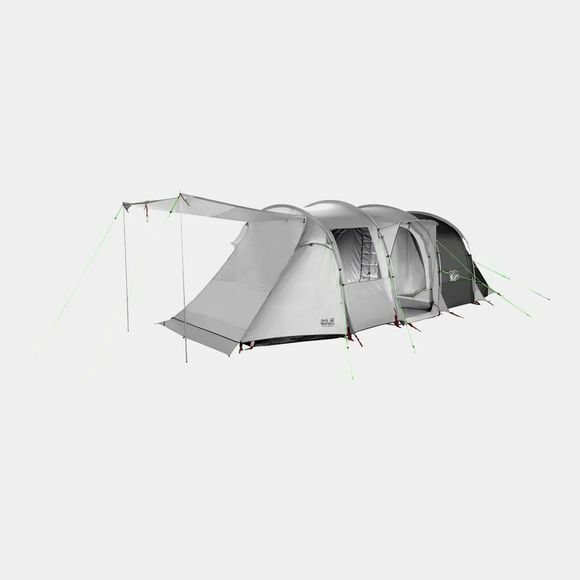 With its comprehensive fixtures and fittings, this tent turn your camping trip into a luxury holiday. The Inner tent is like a comfortable three-roomed apartment. The small sleeping cabin can be hung in the vestibule and the larger one in the main tent. The larger one can be partitioned. If you don't require as much sleeping space you can simply dismantle one of the cabins, in part or in full, and roll it away to the side. This gives you more storage space for your kit. The living area is high enough for adults to stand comfortably. The front entrance is another clever feature. With the help of two extra rigging poles it can be transformed into a roofed veranda area. All three entrances have mosquito mesh screens and two of them also have a small roof to keep off the rain. And because it is easy to lose track of your belongings with so many people in a tent, the Travel Lodge RT Tent has several useful storage pockets and pouches inside. Some of these can be repositioned in different places within the tent, wherever they're needed. The tent floor is protected from sharp stones and twigs by a removable groundsheet tarp.